By CONGAREE (1998). Black-type winner of $3,267,490, Hollywood Gold Cup [G1] (HOL, $450,000), etc. 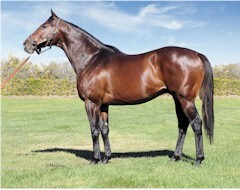 Sire of 9 crops of racing age, 390 foals, 277 starters, 13 black-type winners, 192 winners of 685 races and earning $16,604,823, including Jeranimo ($1,525,364, Eddie Read S. [G1] (DMR, $180,000), etc. ), Don’t Tell Sophia ($1,382,479, Juddmonte Spinster S. [G1] (KEE, $300,000), etc.). Jeranimo’s first foals raced in 2018. Sire of: Disco Tale $22,640. at 8, one win (San Gabriel S. [G2]). Race Record: (In USA) at 3, one win, 3 times 2nd, twice 3rd (San Felipe S. [G2]); at 4, four wins (Strub S. [G2], San Gabriel S. [G2]); at 5, two wins (Citation H. [G2], Oak Tree Mile S. [G2]), once 2nd (Eddie Read S. [G1]), twice 3rd (Frank E. Kilroe Mile S. [G1], Arcadia S. [G2]); at 6, one win (Shoemaker Mile S. [G1]), twice 2nd (San Gabriel S. [G2], San Francisco Mile S. [G3]), once 3rd (Del Mar Mile H. [G2]); at 7, two wins (Eddie Read S. [G1], San Gabriel S. [G2]); at 8, 2014, one win (San Gabriel S. [G2]). Total: 11 wins, 6 times 2nd, 5 times 3rd. Earned $1,525,364. JERANIMO First foals are yearlings of 2017.